Keep warm this winter with these cozy and stylish accessories. Hat in three sizes S (21inch), M (22inch), L (23inch). 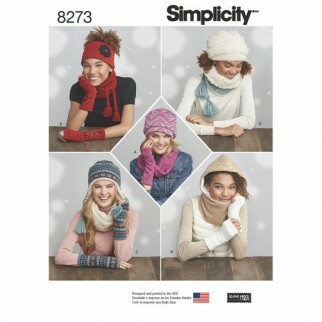 Pattern includes hat in three styles, v. E with unique ponytail opening, hood, infinity scarf in one or two fabrics, scarves, and gloves in two styles. Elaine Heigl designs for Simplicity.